This is a new event for the Downtown West Bend Association! The vendor fair will start at 11am with live music scheduled throughout the day and culminating in Music on Main, one of our summer concert series live music events! 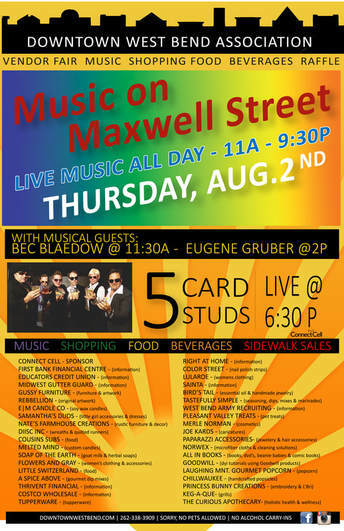 Music on Main brings it's own audience so the vendor fair will have a built-in crowd! Only one representative from each company (i.e. Lularoe, MaryKay, etc.) will be allowed. Email anna@downtownwestbend.com for details and to reserve your spot.